In RavenDB you can create encrypted databases. Each encrypted database will have its own secret key which is used to encrypt and decrypt data. When creating an encrypted database using the Studio, you will receive a secret key which will allow you to recover the encrypted data in case of a disaster. During normal operations there is no need to supply the secret key to RavenDB. See Secret Key Management for more information. 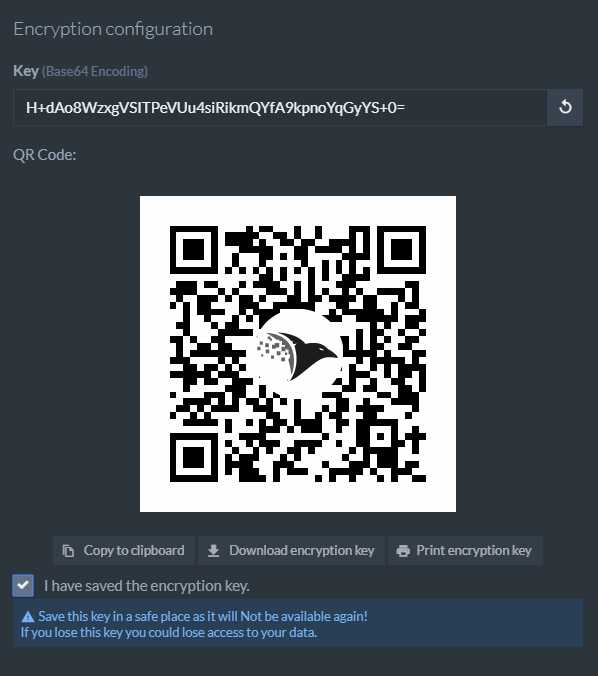 Download, print, or copy and save the secret key in a safe place. It will NOT be available again! Before creating the database, a secret key must be generated. Generating and storing secret keys is restricted to Operator or ClusterAdmin Security Clearances. RavenDB uses a cryptographically secure pseudo-random number generator and it is recommended that you use it. If you must use your own secret key, please make sure it is 256 bits long and cryptographically secure. You must use a client certificate to make the request because the server is using authentication. When generating a client certificate using RavenDB, you will receive a Zip file containing an admin client certificate (.pfx, .crt, .key). Database encryption must be enabled when creating the database. If you wish to use encryption in an existing database, it must be exported and then imported back into a new encrypted database.